How do I know if a photo has been backed up? When Jottacloud discover a photo or video that has not been backed up, it displays a small badge that illustrate the backup state of the photo or video. 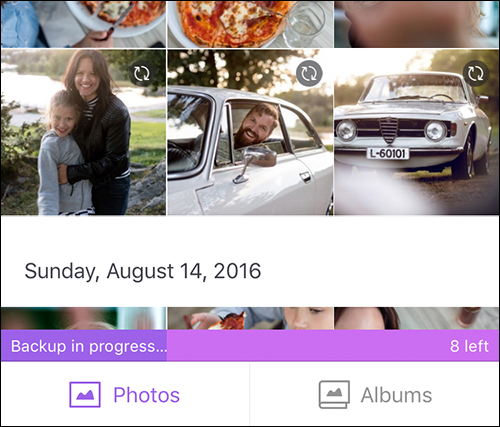 A badge with two small arrows (not rotating) indicates that backup is in progress and the photo is waiting in queue to be backed up. When the photo is next up in the queue, it will start uploading and the arrows icon will start spinning. Once the photo has been safely backed up, the badge is removed. If backup is not possible, either because you don't have an Internet connection or upload is disabled, a badge with a cloud (striked through) will be shown.